The BRAND Liquid Handling Station (LHS) pipetting robot handles routine tasks at high speed and with the highest precision. The LHS closes the gap between electronic pipettes and highly complex, expensive pipetting robots. It is a quiet and compact instrument with a unique front door allowing it be set up in tight quarters. 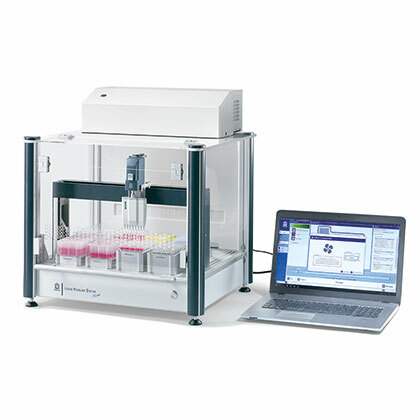 The instrument has 7 working positions and 5 available liquid ends with single channel volumes up to 1000µL and multichannel volumes up to 300µL. The system has the flexibility to move liquids between reservoirs, tubes, and plates. Adapters and racks bring the consumables to an even height, reducing unnecessary vertical movements to save time during pipetting. 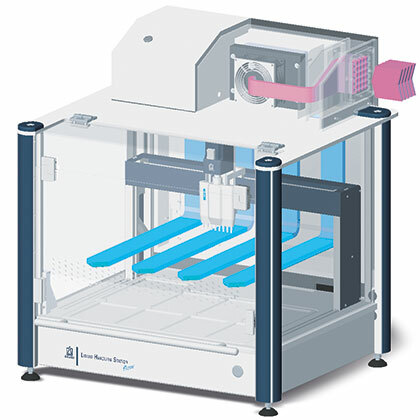 The Liquid Handling Station flow is BRAND’s pipetting robot for applications where samples must be protected from particles and microorganisms. The new FlowBox directs the filtered air flow in laminar horizontal layers across the consumables. With the door closed, the air volume inside the cabinet is replaced 260 times per hour and exits through the front door. The BRAND Liquid Handling Station flow includes the FlowBox filtration unit, motor control unit, operating software, user manual, power cable, USB cable, documentation, on-site training, and a 1 year warranty. Liquid ends, racks, adapters, consumables, and additional service plans are sold separately. Operating computer to be supplied by end user. All conventional pipetting tasks that can be done with single or multichannel pipettes can quickly be defined as a method in the extremely simple software. The easy-to-use, highly graphical user interface allows for method recall or new method creation without requiring advanced programming skill. Define the name for new pipetting method. Set up the work table. Define the commands (Transfer, Wait, Mix, Break). The Liquid Handling Station flow comes with a one year warranty. Two additional service plans are available: Silver and Gold. With the BrandTech Gold service agreement, the warranty can be extended by 12 months. Does the LHS flow come with UV or HEPA filters for cell culture? The LHS flow has an integrated HEPA filter, but does not have a UV light. Does the LHS flow have the ability to heat, cool or mix consumables in place? 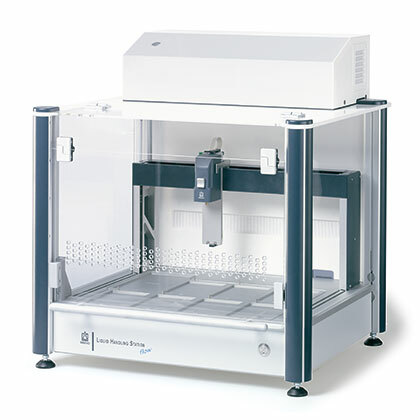 A PCR mini-cooler is available as an accessory. However, specific heating, cooling, or mixing elements are not available at this time. Can the LHS flow be placed/operated in a biosafety or fume hood? This is not a recommended use for the LHS flow. Does the LHS flow integrate with other instruments? No. The LHS flow is a standalone instrument. Can the LHS flow be used in a temperature controlled room (i.e. at 37°C or in a cold room)? No, the operating temperature range for the LHS flow is between +15°C and +35°C (approx. 60-95°F). What is the viscosity limit of liquids that can be pipetted using the LHS flow? Are the height adapters necessary for pipetting protocols? Yes, the software will direct you to use the appropriate height adapter for the rack and consumable you are using. It is necessary to use the correct height adapters to ensure stable support and an even working height for the plates. This allows for a reduction in the pipetting time. Can the height adapters be stacked? Yes, 2 height adapter 30's can be stacked to equal the same working height of 1 height adapter 60. Do BRAND robotic tips have to be used with the LHS flow? YES! BRAND Robotics tips are designed to fit within tight tolerances for both tip fit and tip length. Therefore, it is necessary to use only BRAND robotic tips with the LHS flow. What tips are compatible with each Liquid End? Please consult the Tip Compatibility Chart to see which tips are compatible with each Liquid End. What is the maximum height of a consumable (i.e. tube) that can be used with the LHS flow? The maximum height of a consumable that can be used with the LHS flow is 80mm. Can I use 15mL or 50mL conicals, or blood tubes with the LHS flow? No, the maximum height for a consumable is approximately 80mm because of the compact design of the instrument. What happens if a consumable I use is not in the LHS flow software? Please let us know and provide a sample. We will have it programed into the software at no charge if it works with an existing adapter. If it does not work with any of our existing adapters, BRAND can develop a custom adapter for a fee. How accurate are the liquid ends? Please see page 10 of the LHS brochure. Note accuracy will vary by liquid end and volume range. 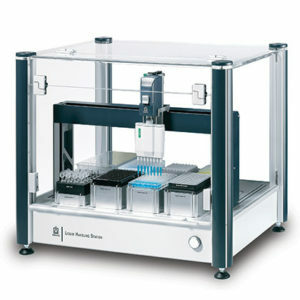 As an example, when equipped with a 200µL liquid end and pipetting 20µL the accuracy is ±4%. Does the LHS flow have a 12-channel head? No, the maximum number of channels is 8. How do I operate the LHS flow? From the intuitive and easy to use LHS flow software. The LHS flow software operates on Windows devices running Windows 7 operating systems or higher that are equipped with a USB port. Can the LHS flow be operated with a MAC? No, the LHS flow has a PC Microsoft based operating system. Can I write my own software for the LHS flow? No, the LHS flow is a closed system with proprietary software. Is the LHS flow a plate washer? The LHS flow does not function as standard plate washer. It will always leave some residual volume in each well. However, there is a "Break" feature within the software that allows for manual manipulation of the plate to "knock off" any remaining residual volume during plate wash steps. Is the LHS flow a plate stamper? No. The LHS flow can replicate plates, but can only transfer liquids at a maximum of 8 channels at a time. It is not a good fit for plate stamping applications. Liquid Ends - Single-Channel and Multi-Channel Liquid Ends and Liquid End Holder. Tips - Standard and Filter Tips, Non-Sterile and Sterile. Adapters and Racks - Height adapters, Racks for Single Vessels and Plates. Reservoirs and Waste Box - Autoclavable reservoirs for Reagent Containment and Disposable Waste Boxes. Consumables - Microplates, PCR products, Microcentrifuge Tubes, and Sealing Films. To request a software demonstration or on-site demonstration of the BRAND LHS Liquid Handling Station flow, please CLICK HERE.